This work offers a firm theoretical foundation for discussing the self-employed, their role over time, and the formulation of policy towards them. 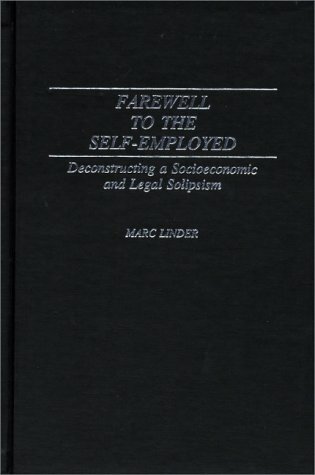 It is a comprehensive analysis of self-employment to integrate legal, sociological, and economic theory. Linder offers a conceptual critique of the underpinnigs of the category of the self-employed that calls into question the theoretical coherence of the traditional approaches. The essays cover a range of historical periods and also include European history and explorations of long-run changes in the American economy. Economists and historians will consult this powerful argument for the importance of historical economics. Part memoir, part crash-course in economic theory, this deeply engaging book by one of the world's foremost economists looks at economic ideas through a personal lens. Rubinstein challenges many of the central tenets of game theory. This book is an analysis of economic fallacies that are so prevalent that they have almost become a new orthodoxy. Their own self-contradictions have have scattered those who accept the same premises into a hundred different 'schools'. This book is designed as a college text for the student's first course in regional economics, at either the upperclass or the graduate level. It presupposes no previous exposure to regional economics as such, nor anything beyond basic economics.